An engine that runs too hot does not last long. While your engine’s cooling system is responsible for regulating operating temperature, your exhaust system also plays a major role. Much of the heat energy of the combustion process is unusable and must be disposed of quickly. That is the job of all the piping and ducting that runs from the motor to the back bumper. Hot air and vapors are cleaned, cooled, and passed safely out of the rear pipe. Old worn out pipes with leaks and restrictions need to be replaced. We specialize in muffler repairs and can install custom exhaust systems that will hwlp keep your engine running at its best. Contact our Meineke #105 in Newburgh, NY, for an evaluation. The more you drive your car in Newburgh, NY, your car muffler undergoes quite a bit of use and it needs to be kept in proper shape. If you notice a decrease in your fuel economy, a foul odor from underneath the vehicle or your car seems to be running louder, you should have your muffler checked. 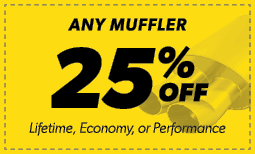 Depending upon the severity of the issue, you may be able to just pay for muffler repairs rather than a replacement. If you notice that your muffler is hanging low under the car, it should be addressed immediately. For a detailed diagnosis, contact a technician at Meineke #105 today. A common question we receive at Meineke #105 in Newburgh, NY, is whether fuel efficiency is really affected by the exhaust system. The answer is yes. Your exhaust system should include an oxygen sensor. This sensor is designed to detect the amount of oxygen that is coming through the entire exhaust system. It sends a signal to your engine to either increase or decrease the amount of fuel it burns to maintain maximum efficiency. However, if the oxygen sensor is defective, it can cause your vehicle to expend unnecessary fuel. Having your oxygen sensor changed every 60,000 miles can help eliminate this issue before it begins. Many drivers make the decision to get high performance exhaust systems. There are several upsides to getting an aftermarket exhaust system installed on your car. The main benefit is that they allow exhaust gases to be released more efficiently, which means more power goes to the engine. Another enjoyable aspect of custom exhaust systems is a more aggressive and deeper tone. Anyone can get a new performance exhaust system installed, but it can be an especially helpful investment for those who are already in the market for muffler repairs. Bring your car to Meineke #105 in Newburgh, NY, for any repairs or replacements you need for your exhaust system. The best muffler shop for your vehicle in Newburgh, NY, is Meineke #105. Our friendly and professional mechanics are custom exhaust experts. They can get your vehicle back in tip-top shape in very little time. We know that muffler repairs can be an unwanted expense, but you can’t afford to drive your vehicle around with a bad exhaust system in place. Along with equipping your vehicle with a performance exhaust that is tailored exactly to your vehicle’s specifications and use, we offer you the most competitive pricing around. Bring your vehicle in today for one of our quality performance exhaust systems for cars and experience the savings.